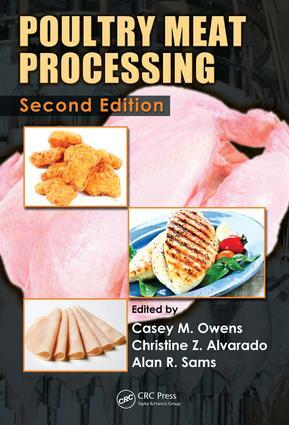 Introduction to poultry meat processing. Preslaughter factors affecting poultry meat quality. First processing: Slaughter through chilling. Second processing: Parts, deboning, and portion control. Poultry meat inspection and grading. Packaging. Meat quality: Sensory and instrumental evaluations. Microbiological pathogens: Live poultry considerations. Poultry-borne pathogens: Plant considerations. Spoilage bacteria associated with poultry. Functional properties of muscle proteins in processed poultry products. Formed and emulsion products. Coated poultry products. Mechanical separation of poultry meat and its use in products. Marination, cooking, and curing of poultry products. Quality assurance and process control. Nutritive value of poultry meat. Processing water and wastewater. Coproducts and by-products from poultry processing. Poultry processing under animal welfare and organic standards in the United States. A brief introduction to some of the practical aspects of the kosher and halal laws for the poultry industry.